Who would have thought eating your fruits and vegetables would be so much fun? 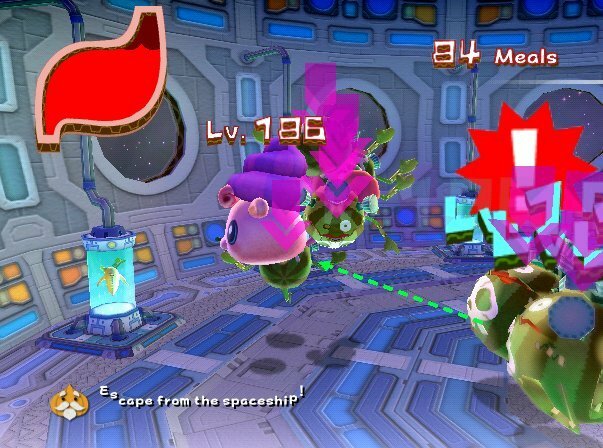 We've already seen some strange stuff from Namco-Bandai in the past with their Katamari Damacy releases, but they appear to have outdone even themselves with their latest oddball outing for the Nintendo Wii console. The Munchables carefully weaves a zany world full of enemy fruits and vegetables to create what has to be one of the most unique gaming experiences you're ever likely to encounter in the world of video games. And as insane as the world around you in the game is, the musical compositions and game play are every bit as outlandish in style and design. But what would appear on the outside to be just another half-hearted attempt to cash-in on an oddball game design actually turns out to be a very charming and engaging experience that's quite difficult to put down once you begin playing it. The basic game play premise behind The Munchables is quite simple. A band of alien vegetable pirates has attacked the island you inhabit and you have to go after them. How exactly do you take down a vegetable? You eat it, of course. And that's exactly what you'll spend the majority of your time doing in this game - at least if you want to clear the game's many levels. But even as integral a part of the game play as munching is, you'll quickly find that there's actually a lot more to the play control system of the game than meets the eye. You'll use the Nunchuk's analog stick to move your character around. You can choose to be either Chomper or Munchy, one being male and the other being female. You press the "A" button to make your character chomp and gulp down any fruits or vegetables that you come into contact with. If you need a bit more accuracy, you can even use the "Z" button on the Nunchuk to lock-on to a specific enemy target. The more enemies you eat, the more your character will level up and grow in size. 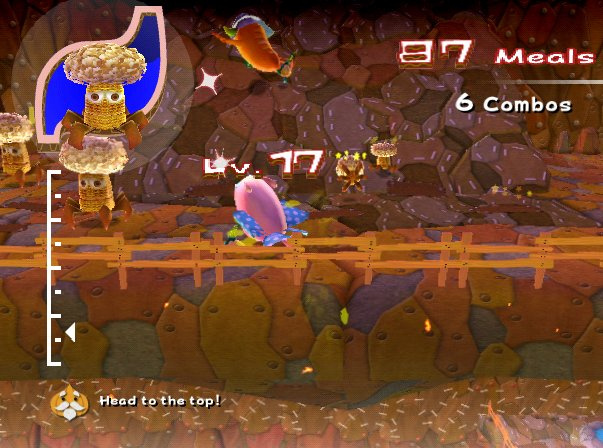 This will allow you to take on some of the bigger and stronger fruit and vegetable enemies in the game. But you'll have to be careful, because if you try to munch an enemy that's at a higher level than you are, you'll be the one getting chomped. You'll always know what level these enemies are at by the level displayed above their heads. You can even have a second player use their Wii Remote to target and shoot at enemies in order to stun them or break them apart, although this makes an already easy game even easier. If you come into contact with any enemies that are at too high a level for you to eat, you can use the "B" button on the Wii Remote to perform a dash attack on it. This will split it into individual parts that might be at a low enough level for you to eat. If not, you'll need to go back and eat some of the smaller enemies in order to level your character up more. It's this leveling up that will decide how successful you are in each level. 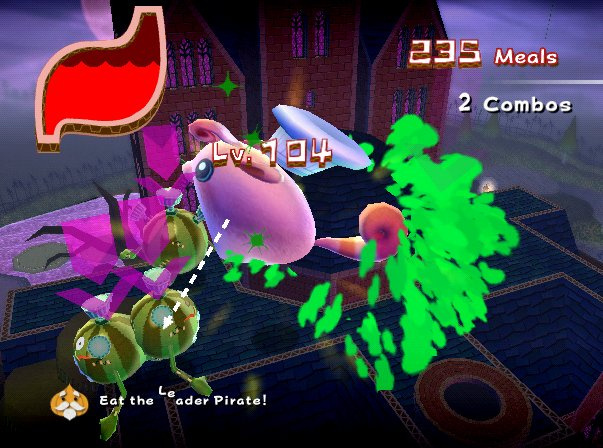 There are assorted goals in each level, some ranging from eating a giant vegetable pirate to helping out fellow animals along the way. You'll find two regular levels on each island followed by a third boss level. While the chomping is the heart of the game play, there will also be quite a bit of puzzle solving and platforming to be done as well. This is where the jumping move comes into play. By pulling up on the Wii Remote, you will cause your character to jump. While you'll be using this move sparingly at first, later on in the game you'll be required to execute some rather tricky leaps of faith. There will also be various keys and switches strung throughout certain levels that you'll have to locate and make use of in order to progress through the level. And to help you out on your munching, you'll also find hidden power ups like the Vacuum or Rocket that allow you to quickly and efficiently gobble up enemies in rapid succession. It's little things like this that add so much playability to the game's simple control scheme and ultimately make it so difficult to put down. Once you've completed a level, the elder will give you a grade based on how much you were able to eat and how many acorns you were able to locate. If you're able to locate all of the acorns on a particular level the elder will reward you with a prize, which is normally an accessory that you can use to customize your character's appearance. You can even go back and try to achieve a higher grade on each level in order to win more accessories. This adds a decent amount of replay value to the game since it can be quite fun to go back through a level once you have a better idea of what to expect from it. The boss fights that you'll face at the end of each island are a particularly impressive part of the game. 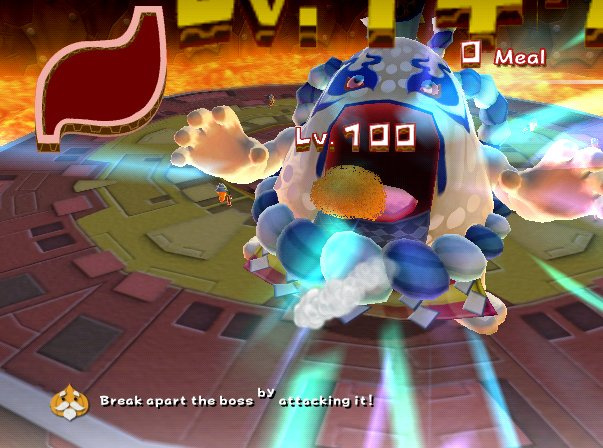 Not only are the bosses absolutely enormous in size, but they're even more insane than the normal fruit and vegetable enemies you'll face. Each boss has its own distinct movement and attack pattern, so it's never too tough to figure them out. Whereas boss fights can sometimes feel out of place in certain platformers, the one in this game tend to perfectly compliment the munching action of the regular levels and provide a nice change-of-pace. You'll actually catch yourself looking forward to these battles as you play through each level and they're the perfect incentive to keep trying to progress through the normal levels in the game. In addition to the main game, you will also find a few extra game modes to toy around with. The Closet mode will allow you to dress up and customize your character using the various accessories you've earned from the elder for scoring lots of orbs and acorns during each of the game's levels. There's also the Tabemon Encyclopedia that allows you browse through all of the various enemies you've eaten up to that point in the game. You can even tune into the Tabemon Channel where you can watch in-game videos and listen to the many musical tracks found throughout the game. While these might seem like minor additions on the outside, they can be a lot of fun to go back to once you've made some serious progress in the main game itself. The simple play control and well thought-out level designs make playing the game a real joy. The difficulty is a bit on the easy side, even later on in the game, but it's got plenty of challenge in the grading system that will keep more seasoned players going back to try to earn the "S" grades. 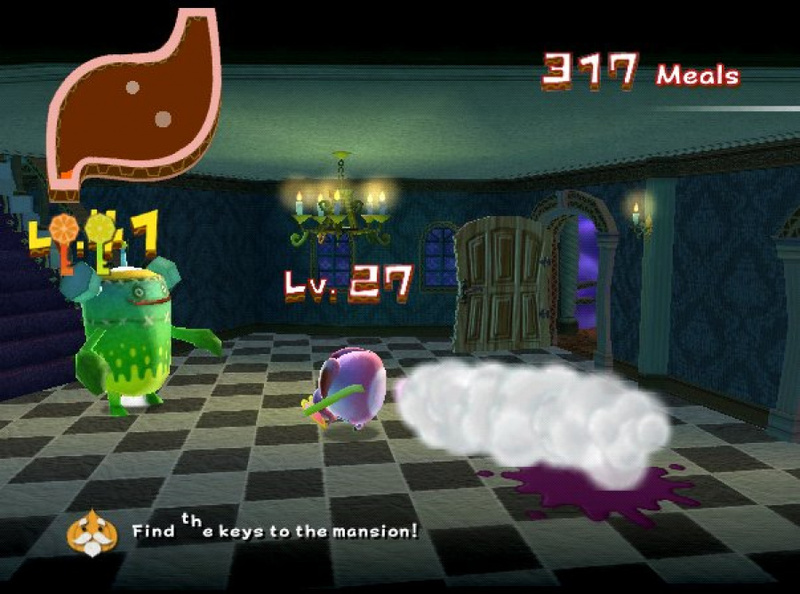 The play control can be a bit loose at times, making some of the intricate platforming sections a bit tricky, but the munching game play is extremely well executed and makes it quite easy to lock onto and chomp enemies, even when the action gets extremely intense. For all the unique gameplay twists, in the end you'll generally find yourself getting really caught up in the attacking and munching elements when things get really hectic, so much so that you'll often find yourself getting sidetracked from the task you're ultimately supposed to be accomplishing in each level. It's a good sign of just how engaging this simple play control idea truly is and how well the designers have blended it into the other puzzle solving and platforming elements of the game. Visually there isn't another Wii title out there that can touch The Munchables when it comes to sheer visual funk. The mix of 2D and 3D visual elements make the game jump of the screen and at times give it a very storybook-like look and feel. All of the enemies and bosses show a lot of vibrancy and detail, and the animation in the game is top notch. The sheer variety in each level is also a highlight and gives even levels within the same island a lot of diversity. 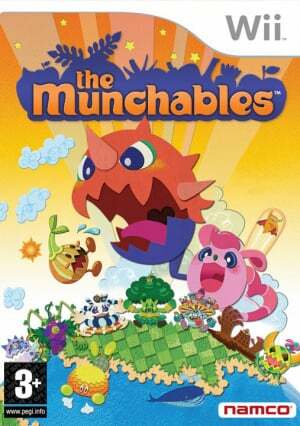 Much like the aforementioned Katamari Damacy series, The Munchables has one of those unique visual styles that truly differentiates it from everything else out there, and it's probably the one aspect of the game that players will find the most appealing. It's an experience you're not likely to ever forget, that's for sure. Not to be outdone by the other zany aspects of the game, the musical compositions are equally bizarre, featuring everything from silly circus-like tunes to the booming techno tracks that play during some of the game's more intense moments. And the developers have made sure that each and every track fits its level to a tee. Even the sound effects are insane and the mumbling dialog coming out of the various characters mouths is equally humorous and effective in carrying out the game's off-the-wall antics. The music just seems to get better and better as you progress father into the game and some of the tracks playing during the Ghost Island are absolutely incredible. If you've got a nice Dolby sound system you'll especially appreciate the way certain intermission tunes have a very metallic sound resembling the tunes you used to find blaring out of the old-fashioned carousels at your local carnival. You'll really notice the way these pieces stick out as compared to the more booming bass from many of the other musical tracks. It's a small touch, but it really gives the game's audio presentation an even sillier twist. The Munchables proves that even an idea as rudimentary as eating fruits and vegetables can be turned into a winning game play idea. While the game's play control system can be a tad loose in feel at times, the overall experience is still solid and proves that you don't have to have a lot of bells and whistles in your play control design to make an involving and enjoyable game. If you've been looking for something fresh and original, look no further than The Munchables. There's isn't another gaming experience available on any console that's quite as uniquely bizarre as the one found in this release. There's also not one that you'll have as much fun with while munching down your daily allowances of fruits and vegetables either. If you think this game sounds crazy, just wait until you actually play it. Not my type of game but I'm glad to hear it's pretty decent. If i ever get the chance to play it, I'd give it a go. Nice review Corbie! I was hoping for a good score on this one and its good to see that the game delivers. This wasn't even on my list of games to buy but I definitely want it now. Unfortunately I can't find this game for sale anywhere. Good luck finding it. I had a heck of a time locating this game. I might go buy a few extra copies in case they become really sought-after. I'm baffled as to why all the mainsteam placces seem to have ignored this title (this is the second review I've read though looking on metacritic there are are two more i've not read). All I can say about Euorpeans looking for a copy is don't even bother looking in the high street. If Klonoa got no high street stock (even specialists such as GAME) what chance does this have? Thankfully the online prices seem to be good with Amazon.co.uk asking for £17.99 (though the RRP is £24.99 which seems baffling given Klonoa had an RRP of £19.99). eating stuff in noby noby boy was fun and it seems eating stuff in munchables will be the same!! I'll probably end up getting this in the next couple of months. Good to see Namco still doing fun wacky stuff! Glad to hear it turned out well in the end. Reminds me of Pac-Man and Billy Hatcher. Wow! It actually turned out good! I'll have to try it sometime. Yup, figured it'd be an 8. I won't get it, though. Not my type of game. @Starwolf_UK - The "mainstream" press only considers blockbuster titles. Indie games and games from smaller studios don't show up on their radar. Which is a large part of why the mainstream press has trouble with the Wii. The Wii's strengths are in its diversity, not its blockbusters. I purchased this a few days ago and tried it out last night. The eating/growing/absorbing genre is one I enjoy very much. The intro, story and dialogue upon startup is offputting, but the gameplay mechanics shine. I just want to expand on the multiplayer aspect, since the review doesn't go into it. 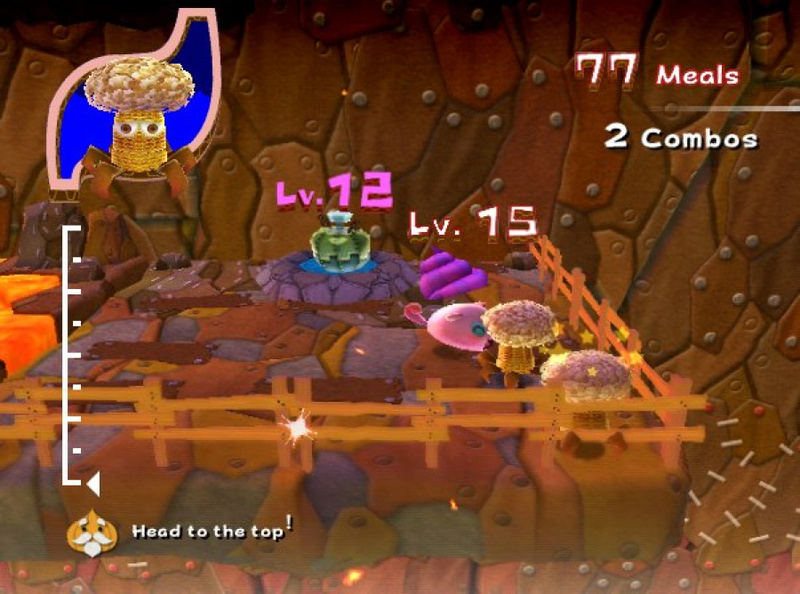 A second player can use a wiimote to fire at enemies on screen. This stuns enemies that are the same size and smaller (which you can eat), and breaks up enemies that are larger (which you can't eat). The ammo has a slight recharge delay, so the second player can't blast away. As mentioned in the review, this game isn't terribly difficult, and you don't need the help of a second player at all to complete. But there are a great many times where the second player comes in handy by stunning quicker enemies, breaking up monster enemies and helping out in the boss battle. If you are gaming with your child, or want to involve a significant other or friend in a shared single player experience, this is a great feature. I'm debating whether or not to pick this one up now, on one hand the price could drop and I can get it cheap (plus I have to finish all my other games first), or I can buy it now, for more cash (and I won't play it till' I finish my current stuff, which is a lot of Xbox games. Curse Gamestops buy 2 get one free sales! ), but I am guaranteed to get it. Ah, the difficult decisions us gamers make. I just realized this is a 3D version of Shark! Shark! for Intellivision. The cop-op feature just makes an already fairly easy game ridiculously easy. And it felt like something they added in at the last minute to me. I added a mention of it, but I hope people will play the game as a single-player experience. Thanks for the review, it sounds like it was a lot of trouble to obtain. I'll pass for now, but will probably regret it later. Great review Corbie, This sounds like my kind of game: fun, I'll buy this game, if I find it. WOW...wasnt expecting that one. Glad to see you had fun with this one Corbie. Definitely one for me to look out for. It combines 2 of my favorite Namco franchises, Katamari Damacy and Pac-Man. Wow! Namco-Bandai's on a roll! Erm, how many worlds are there in this game? I liked Klonoa, but it was definitely on the short side. I want a game that'll last me. There are few copies of this game collecting dust at a new video game store where I live, the guy said they haven't sold a single copy since they got it. I've seen the game advertised on websites quite a bit, but it just doesn't look appealing at all. Just looks like another piece of shovelware. This review has certainly made me more interested. Thanks guys. @0-Watt : There are seven 'real' worlds and one more "repeat-all-bosses" world after that. After summing together the times Wii message board play history messages tell me I spent playing the game I get just shy of six hours. On some stages, I spent extra time on finding all the acorns, and I did die a few times (especially on the first level of the last world when I tried to go after one particular acorn). The most frequent rank I got from different levels was S on the first try, so this scale definitely wasn't set too hard. Overall, this didn't feel nearly as short as Klonoa did, probably because this was a more hectic game.